Entry to the 9/11 Memorial is Included! This tour includes an entry ticket to the 9/11 Memorial. This is THE thing to do in New York City this year! The NYC Freedom tour is designed to help reduce traffic around the 9/11 Memorial at the World Trade Center site — we get there by boat! Don’t waste time waiting in a 3-hour line to visit the Statue of Liberty — we’ll get you up close and personal on a boat for the best photo opportunities. The NYC Freedom tour includes two boat cruises and a tour guide that stays with you for the entire tour. This tour starts with a boat cruise to Battery Park, then a 10-block walk up to the 9/11 Memorial site. Your tour guide will show you the new 9/11 Memorial and will tell you about the Memorial and the World Trade Center tragedy. After seeing the Memorial, your guide will walk you past the Firefighters’ Memorial, to see Wall Street and Trinity Church. During that walk, you will learn the in-depth story of the 9/11 attacks and how New Yorkers dealt with the tragedy. Our New York native tour guides will educate you about the recovery effort, the way in which the attacks affected life in New York City, and the new One World Trade Center tower that is being constructed at the site. You will also see Wall Street, where the tour guide will show you the site of the first terrorist attack on the United States. You will then take a short bus ride to South Street Seaport, where, after a short break, you will take a boat cruise along the Brooklyn Bridge over to Fulton Ferry Landing in Brooklyn. You’ll make a quick stop, and then the boat will take you to the Statue of Liberty to get up close and personal with Lady Liberty for fantastic photo opportunities. NOTE: Be prepared for a lot of walking on this tour, because there is much to see in Lower Manhattan near the former World Trade Center site. The tour guide will accompany you the whole way. When you get off the bus or boat at a stop, the tour guide will hop off with you. No other tour in NYC offers this powerful benefit. No other company offers guided visits to the 9/11 Memorial. This one fact will dramatically improve your visit to New York City because you won’t just “see” the city — you will truly “experience” the city. You will have one tour guide assigned to your group of about 30 people, and that tour guide will stay with you throughout the tour. She’ll ride the boat with you, she’ll narrate your bus tours, and she’ll walk you through various attractions to make sure you don’t miss the little things that make a difference – especially in the 9/11 Memorial. 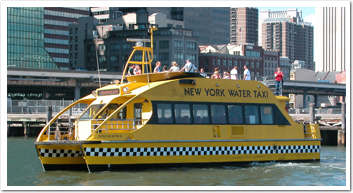 If you are serious about touring New York City, and you like being on the water, this is the sightseeing tour for you! This tour is one of the great values in New York City. The tour pays for itself in transportation and time savings by avoiding the highest traffic areas of NYC. The NYC Freedom Tour provides you convenient bus transportation between Times Square and the boat (a $20 per person value), two boat cruises that are worth $27 each, and a guided tour of Ground Zero area that is worth $60 by itself. The total value of the package we have put together is more than $127 per person, but you only pay $59.99 Friday-Sunday and $49.99 Monday-Thursday for adults, and $49.99/$44.99 for kids under 12 (plus ticketing/handling charges) if you book now online. Tour departs at 11:00am daily. The 9/11 Memorial opened on September 11, 2011, the 10th anniversary of the attack on the twin towers of the World Trade Center. The 9/11 Memorial is at Ground Zero and offers a sobering tribute to those who lost their lives and the heroes who survived. The NYC Freedom Tour will include tickets to the 9/11 Memorial, and your tour guide will accompany you inside to see the Memorial. Reserve my NYC Freedom Tour Now!